UPDATE: The shutdown originally scheduled for April 24th and 25th did not take place, but has been rescheduled for Tuesday, May 9th from 8:00 am to 5:00 pm. 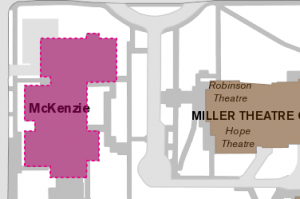 On May 9th at 8:00 am until 5:00 pm, there will be a shutdown for the chilled water service to McKenzie Hall for the purpose of installing a water meter device in the main inlet to the building. Air conditioning for the building will be affected. Work will be performed by GBC Contractors and Twin River Plumbing. For questions or concerns about how this may affect your services, contact Gene Mowery, Campus Planning and Facilities Management (CPFM) Design and Construction at 346-5593.